Looking at ways to enjoy teaching and to get students actively engaged in learning? At Perceptions, teaching deen is now going to be interactive using contemporary learning tools. We hope to enable learning by making your approach effective and environment conducive to fun with positive and simple programs. Expanding Islamic literacy is the objective and motive behind Perceptions’ drive. Providing a wide window on topics related to basics of Islam and to some specific injunctions. Perceptions came into existence to alleviate wrong notions and biased precepts that are all around in our communication. Misinterpretations that Muslims and others readily accept, without questioning their correctness… without knowledge and without understanding. Perceptions thus embarked on programs for pre-teens and teenage girls to bring about a perception change or paradigm shift. The logical sequence to the success of our organized presentations in module format prompted us to make it accessible to all. It is a free teaching resource that provides power point presentations – with their transcripts, lesson plans, worksheets, supporting audios & videos and interactive packages. Materials are all organized in module formats that are defined with regards to age and/or capacity to grasp and absorb concepts. Perceptions is always ready to help and assist in designing your programs. The curriculum gives the teacher a complete outline on most Islamic subjects in a presentable form with relevant support material. You can use lessons as-is or alter them according to your requirements. Your lesson plan will be as simple as selecting any topic from modules below. To understand how nature is based on abundance &that Allah (swt) has enough for everyone. To introduce concept of Tauheed through the names of Allah (swt). To see how we can use our logic to get to Tauheed. To understand the concept of being Allah (swt)'s viceroys on earth. To see that Islam is a complete way of life, not only a set of religious beliefs. To understand the significant aspects of Islam & see how user-friendly it is. To see 'green' Islam, focus on water conservation, & demo of wudu with 1/2 litre water. To understand how life's challenges help us discover who we are. To learn the qualities of an effective listener & a speaker from Rasool Allah's (pbuh) example. To understand the science of human creation in accordance with the Quran. To see that Islam & science agree on how the Universe began. To understand the significance of the human soul. To see an amazing creation of Allah (swt) & learn lessons from it. To appreciate the contributions of Muslim Scientists in human technological progress. To see how we ourselves are responsible for most things that go wrong in our lives. To learn how to deal with fear—both internal and external. To learn how to purify our thoughts in order to have inner beauty. To see how a beautiful mind reflects in our interaction with others. To see how righteous deeds are deposited with Allah (swt), we'll get their benefit later. To see how to cope with & find khayr in trials sent by Allah (swt). To see how popular culture dictates a virtual & unreal idea of love. To see how some celebrations have roots in pagan beliefs & that we are what we celebrate. To understand the explanation of this verse. To see the physical components of the book of Allah (swt). To look at the revelation & compilation of the Quran. To understand the key message of the surah through an interactive activity. To understand the key message of the surah - sincerity towards Allah (swt). To understand the key message of the surah. To see that wanting stuff is not a problem, focussing on wants only is greed, to learn the cure. To understand types of lies, their implications & learn how to cure this destructive habit. To understand the importance of & learn the ettiquettes of making du'a to Allah (swt). To see how Islam promotes creativity & open mindedness in worldly matters. To learn importance of respecting parents through a role play. To learn to find creative solutions to life situations. To practically teach mind mapping technique. Learning how to overcome certain mental blocks that halt personal development. To learn sunnah way of eating & drinking and its' benefits. To understand the meaning & purposse of "ilm" in Islam. To introduce different branches of Islamic learning. Explanation of "Keep-it-simple-stupid" principle, how to apply it in our daily lives. To see the desirable characteristics of a true seeker of knowledge. To understand the importance of having the right attitude in life. To thank Allah (swt) for beauty around us & to provide guidelines for creating permissible art. To see how to regulate use of cell phones & learn the ettiquettes of using them. To understand the importance of having good “clean” fun. To demystify magic and fortune telling in the light of Quran; and to understand the key messages of Surah Al Falaq and An Naas. 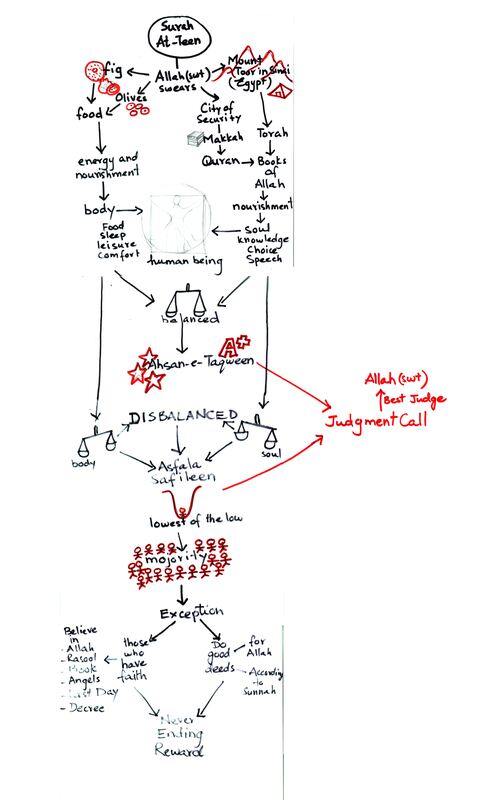 To understand the message of the surah through mind-mapping. To narrate story of the ashab e Kahf from Surah Al Kahf & draw parallels with today's youth. To analyse the glamour promoted by popular culture & see that all that glitters is NOT gold. To understand the temporary & fragile nature of this life. To see the kinds & consequences of backbiting & learn how to treat them. To identify and cure the disease of heedlessness in ourselves. To learn importance of engaging with the Qur'an & tips on "how" to practically do it. To understand meaning of "shukr" & realize what all we should be grateful for. Importance and way of repentance to Allah (swt). To see how important it is to have above, around & below relationships in our lives. To understand concept of mehrams & non-mehram and to categorize guys in our lives. To learn interaction etiquettes with classmates & teachers. To learn Islamic etiquettes of gender interaction. To learn lessons from story of Musa (as) & his wife-to-be in Surah Al Qasas. To understand the symptoms, triggers and cure of procrastination. To understand the dynamics of this habit & learn how to cure it. To understand the significance of time and habits, To learn to be Proactive. To learn how to “begin with the end in mind” and time management. To learn how to put first things first. To learn to handle the Internet & social media responsibly. To understand the difference between reality and virtual reality. To understand the message of the surah. To read the “most beautiful story” — story of Yusuf (as). To draw lessons for ourselves from Yusuf(as)’s story. To look at how Yusuf(as) dealt with temptation & see what we can learn from it. To identify and cure the disease of boasting & arrogance in ourselves. To see the role of our tongue in making or breaking our Hereafter, learn to safeguard against it's sins. To understand the significance of Allah (swt)'s invitation to prayer & compare it with worldly invitations. To learn the proper way of covering ourselves for Salah. To understand the reality of mankind’s worst enemy. To try to improve the quality of our Salah. To see that we can only achieve balance in our life if we follow the sunnah. To demonstrate salah positions & to learn basic wordings of salad. To demonstrate salah positions & to learn basic wordings of salah. To understand that Salah is a peg in our life. To understand the meaning of Taharah and bathroom manners in Islam. To understand the concept of oral hygiene, physical hygiene & personal grooming in Islam. To understand the concept of menstruation & uterine bleeding. To understand the dos & don’ts in menstruation & method of performing wudu. To understand the conditions that nullify ablution and tayammum. To learn the importance of performing Salah on time. To understand the concept of prayer in different religions. To understand the concept of halal and haram & understand the rationale behind it. Handling peer pressure and other challenges while dealing with friends. To appreciate the importance of working together for attaining a common goal. To introduce common healing ingredients used by the Prophet (pbuh). To get inspiration from a contemporary Muslim woman. To appreciate the importance of sahaba as our role-models. How to handle hardships and misfortunes in life. To understand how "ordinary" people can be "heores" in everyday life. To reflect and analyse on what has been learned over the past academic year. To understand the concept of Reactive and Proactive, and learn how to be more Proactive in life. To understand the value of purposeful planning for this world & for the Hereafter. To see what factors affect our perception of ourselves and the world. To recognise and respect the rights of Animals in Islam. Music is food for the soul? To define what is “music & analyze the rulings on prohibition of music. To understand the concept of Al Hamd. To understand the qualities of Allah (swt) in the surah. To undersatnd the concept of sirat al mustaqeem. To understand the types of people mentioned in the surah. To learn the reality of the aakhirah and prepare for accountability. To understand & learn lessons from the story. To understand the concept of jealousy and its types. To understand which foods are permitted and prohibited in Islam. To understand which food are healthy and pure. To understand the concept of dhikr & learn how to incorporate it in our daily lives. To understand how we can trust Allah (swt) in all our affairs. To identify the problem of negative anger in oneself and learn how to deal with it. To understand the psychological perspective of anger management. To understand the Islamic perspective of anger management. To learn anger management strategies from the Qur’an & sunnah. To understand the importance of honouring commitments. To understand how volunteering is beneficial for the volunteer himself. To spread awareness regarding unnecessary pre wedding rituals & their consequences. To spread awareness regarding sunnah way of getting married. To see how “beauty” is defined by media, manifests in pop culture & effects self-image. To take heed from the description of Hell given in the Qur’an and ahadith. To get inspired by the description of Jannah given in the Qur’an and ahadith. To understand how clothes are an outer sign of haya & to see how ideas are formed. To understand the meaning of “awrah” (must-cover body parts). To understand libas (dress) requirements for a Muslim woman. To understand the concepts of Zeenat (beautifying) & Tabarruj (showing-off) in our attire. To look at the concept of haya & compare with misconceptions about modesty in our society. To understand the role & impact of haya on all aspects of our lives. To understand the relationship between modesty and faith. To learn how not to make false modesty an excuse for not doing good deeds. To see evidences of hijab being a commandment not recommendation of Allah (swt). To understand commandments of hijab related to attitude. To understand the rationale & wisdom behind the rulings of hijab. To learn practical steps on how to do hijab. To understand the reality of mankind’s enemy. To see what tactics Satan uses against us. To see what tactics Satan uses to distract us from the straight path. To understand the effect of Satan’s tactics on human beings. To learn about the weapons Allah (swt) has given us as protection against Satan’s tactics. to learn key lessons from the life of Prophet Nuh (as). To understand the important lessons from the story of Nuh (as).